There are many reasons why I love Autumn, or as some of my American readers may know it as - Fall. Not only does my birthday fall on the 27th of this month (I'm going to be 22 in case you were wondering! ), there's also Halloween to look forward to, all the fancy dress parties, more excuses to spend cosy nights staying in and keeping warm etc... I could go on forever! But what I really love is the change of fashion: the new season brings a whole new selection of gorgeous trends, and WithChic have got some fantastic pieces perfect for the fall season to choose from. Here are some of my favourites I spotted, specially handpicked to provide you with both style and comfort! Black Skinny Ripped Distressed Jeans I am obsessed with distressed jeans, and if they're black, even better. If you weren't already impressed with how they look in the pic above, check out the other Lookbook photos in the link. You'll be amazed at how awesome they look paired with other outfits.. they are the jeans to go with absolutely anything. Black Stripe Button Front Tie Waist Cami Romper Playsuit I know what you must be thinking. 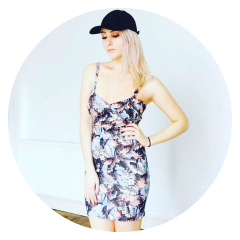 A playsuit for Autumn? Surely playsuits are only suitable for the summer? But I like to think why not bring these beautiful statement pieces with us into the next season! Teamed with a pair of black tights, long cardigan, and knee-high boots, they have the potential to look even more incredible. Navy Asymmetric PU Trim Waterfall Coat with Zipper Detail Every year I like to buy a new winter coat. It's sort of become a tradition for me to do so (or at least to be gifted one!). Last year I was given a stunning cream and beige faux fur waterfall drape, and the year before my kind mother bought me another warm faux fur winter coat. There's something about this one that looks so classy and elegant that I couldn't not feature it in my wishlist. I'm a big lover of black clothes for the winter seasons and this one is perfect. Black Skinny Leather Pants If you're bored of wearing the same old black leggings with everything, these pants are for you. I love the fake leather look (if it's real leather even better!) and they really glam up any outfit with such ease. I really like the colour coordination with the maroon coat featured in the Lookbook picture as well! So, which piece from the Wishlist have you got your eye on? Is there anything else from Withchic you love which I haven't seen? Feel free to link me any outfit combos in the comments: I'd love to see them! So go forth, get creative, and put together your perfect autumn wardrobe for 2015.